An edited version of this Op-Ed was published on Truth-Out.org. Unfortunately they edited out many of the most important parts that spoke about the systematic exploitation of Puerto Rico by the United States over the last 100+ years. What has been done to Puerto Rico’s indigenous economy is a crime against all of us: those born on the island, those who’ve been forced to leave in search of a better financial future and people like my husband and me. We’re not Puerto Rican but came here and call this island home. This fertile land is capable of feeding, clothing and sheltering its own (and has done so in the past), but 97 percent of what is consumed here is imported from the U.S. mainland, a monopoly made enforceable by Puerto Rico’s peculiar status as a colonial possession in an allegedly post-colonial era. The development of our island’s political economy has been stunted, strangled, stonewalled and straightjacketed by outside forces with an agenda that is as transparent as it is self-interested. Even our animals are suffering—our population of uncared for and abandoned dogs and cats has skyrocketed to 300,000 dogs and over 1,000,000 cats, as these innocent creatures are made to pay the price for the artificially manufactured poverty and deprivation that have become Puerto Rico’s calling card. The October 30, 1950 simultaneous uprisings in Utuado, Jayuya, San Juan, Mayagüez, Arecibo and Naranjito that brought in the National Guard, P-47 Thunderbolt bomber planes, and resulted in many in the nationalist party dead, with many more arrested. All of these outrages (and the dozens not listed) are deserving of exposure and if there were truly justice in this world, many would result in the payment of reparations to the families of the abused and to everyone else whose lives were forever affected by these shameful episodes. Collectively, they tell the tragic tale of a people whose basic freedoms and rights of self-determination have been spat upon and trampled in the dust in order to serve political, corporate, military and financial interests in the mainland U.S.
*For more information about Puerto Rico's brutal history at the hands of the United States government, the book The War Against All Puerto Ricans by Nelson Denis documents it great detail. The current situation shows that nothing has changed in the last 100 plus years. The only difference now is that financial manipulation, thievery and blackmail have become the tools of choice for the modern-day robber barons. Explicitly violent police-state-style repression has gone somewhat out of style, but chains of debt have proven to be a far more reliable method for imposing the will of the one percent on every hill, hamlet and landscape where even an ounce of independence still exists; in Greece, Iceland, Ireland, Argentina and especially Puerto Rico, where the debt slavery scam has been taken to a whole new level. The latest insult to this island’s dignity, H.R. 4900 bill—dubbed the so-called Promesa (promise in Spanish)—would put the island’s fate under the control of a financial management board of outsiders whose primary purpose would be to see that bondholders get paid first and that no meaningful debt restructuring occurs. Of course the sponsors’ real, deeper purpose would be to impose an austerity program on Puerto Rico designed to bring it into line with the neoliberal vision of a completely privatized, deregulated world. This model of “development” hasn’t worked anywhere. And yet it’s the only alternative being offered to the people of our beleaguered island, who are seeing our world crash all around us thanks to the tactics of the financiers and their foolish collaborators in the Puerto Rican government. Never mind that this thoroughly discredited model for a political economy has brought massive un-payable debt, the destruction of the middle class and a loss of economic security everywhere it is tried. No, as long as the ownership class benefits, this is the type of economy we are forced to accept, come hell or high water (and we have plenty of both). And by the way, nothing I’m saying here can be dismissed as “just an opinion” or hyperbole, hysteria, rabble-rousing or left wing ranting—it is all easily observable fact. No conspiracy theorizing is necessary to understand what has been going on. There has been no obfuscation. They (the debtors and their collaborators in the political class) are very clear about what they’re doing and unapologetic about why they’re doing it. Big banks and hedge funds matter more than ordinary people and what they want must come first, in an insane global economy where people get obscenely rich through usury and speculation and not by producing actual goods and services. Austerity will chain us to the mistakes and greedy predations of the past and leave us helpless to overcome our present situation. As an alternative to this counterproductive nonsense, along with some measure of sensible debt relief, we need a way to generate our own income, expand our tax base organically and put Puerto Ricans back to work in sustainable jobs that pay respectable wages. Legalizing marijuana would have been seen as far too radical and speculative in the past, but the legalization experiments in Washington and Colorado have, by any objective measure, been a success and have set a great example that aspiring entrepreneurs here in Puerto Rico could follow. As of now, each of these two states is bringing in somewhere around $70 million in expanded tax revenue as a result of their forward thinking about marijuana. If we adjust for population size, this could mean a $40-$50 million yearly revenue increase for Puerto Rico, should it be allowed to pursue the legalization option. But this number is deceptive, because it doesn’t include all the money saved after legalization through reduced costs for policing, prosecution, probation and imprisonment. It is safe to say the failed “War on Drugs” has largely and primarily been a war against marijuana and people of color, and ending that hopeless campaign could save taxpayers in Puerto Rico tens of millions of dollars annually. Since marijuana is largely non-addictive its increased availability would not cause a dramatic expansion in the need for substance abuse treatment services, which admittedly could happen if harder drugs were legalized. The drug busts that most often make the news are seizures by the DEA either at the airport or using the U.S. Postal Service as an entry point from South America to the U.S. However, the following infographic should give you an idea of the number of people serving sentences on the island for non-violent crimes. The populations combined of The U.S. Virgin Islands, Guam, American Samoa and Northern Mariana islands is 382,560, as compared to approximately 3.5 million residents in Puerto Rico. 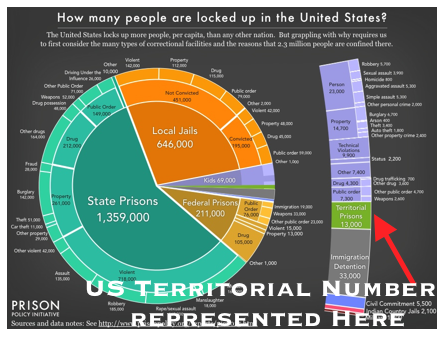 We can safely assume the majority of the 13,000 noted in the infographic refers to Puerto Rico. If legalization were done right, locally owned enterprises would control every aspect of the marijuana trade on the island, from production and processing to distribution and retail sales. The new taxes collected could be used to fund vital social services and help pay off the debt. 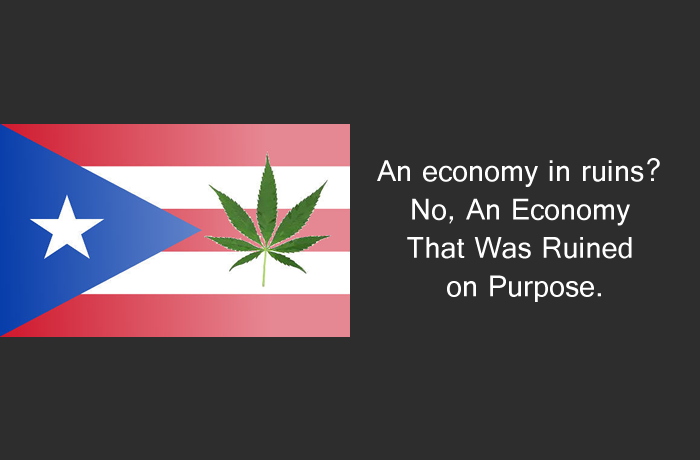 Marijuana legalization could set Puerto Rico on the road to at least partial self-sufficiency, reducing poverty and unemployment while encouraging the spirit of entrepreneurship. Enhanced revenue from legalization wouldn’t get the banks and the hedge funds paid off completely; not in the short term anyway. But it could stabilize the situation just enough to give the Puerto Rican government the breathing room it needs to negotiate a new debt repayment agreement on terms it could actually almost maybe possibly afford—as opposed to now, when paying the debt in full would mean the end of everything. It is easy to see why some might dismiss marijuana legalization as a gimmick and not a real alternative to the plunder, pillage and profit extraction that currently reign supreme. But while legalization is not a be-all and end-all, it could represent a significant step in the right direction. Authentic, sustainable grassroots development could finally become a reality in a nation that desperately needs to start building something of its own. And what is the alternative, anyway? A $4.25 minimum wage for young workers, as H.R. 4900 PROMESA bill sponsors propose? The selling off of public assets to private interests at pennies on the dollar? Let’s get real here: even the people responsible for these ideas don’t believe they’re going to do the people of Puerto Rico any good—they see an opportunity to ramp up the exploitation and they don’t intend to let it pass by. Moreover, they don’t have to live with their proposals … we do! Poverty rates on the island are above 40 percent and no one in their right mind could believe adding a new lower tier to the minimum wage is going to make that number better. Puerto Rico’s population has begun to decline again, as young adults in particular leave the island for the mainland in search of better opportunities. As an example, the island has only one pediatric cardiologist. Ultimately all of these men and women are going to need quality jobs, if they’re to add to the GNP, pay taxes and support their families. Wouldn’t it be better if they could stay right where they are to find those jobs, instead of leaving for supposedly greener pastures that these days no longer even exist? The best way to address the issue of marijuana legalization is through a ballot initiative. The citizens of several U.S. states have been allowed to have them and we who live in Puerto Rico and who are most affected by any measure taken should have that same right. Allow us to speak, hear what we have to say and let our collective preference guide your policy decisions going forward. Congress might not agree, but that shouldn’t stop us from having the final say—for once and for the first time ever.